According to the United States Department of Agriculture (USDA), you can safely store food at zero degrees Fahrenheit indefinitely. Rapid freezing is best to help food maintain its freshness. A typical piece of meat will take about two hours to completely freeze. The longer it is left in the freezer, the deeper the freeze. Keeping foods safely frozen in a cooler can be a bit more challenging. However, with a bit of vigilance, it is possible to keep food frozen in a cooler. Freeze all items that will be stored in the cooler thoroughly in your home freezer. Put the items in the freezer at least two days before you will be putting them into cooler to ensure they have a deep freeze. Freeze a case of water bottles. These will take at least 48 hours to become completely frozen. The longer they are stored, the more solid they will become. Place a row of water bottles along the bottom of the cooler. Place the frozen items on top of the water bottles. Place the remaining water bottles on top of the frozen food. Fill several gallon-sized sealed plastic bags with ice cubes. The exact number of bags will depend upon the size of your cooler and the amount of items that are already inside. Fill the remaining space in the cooler with the gallon sized, ice filled bags. Pack the bags between the water bottles and in any empty gaps. Check the ice in the bags regularly. As the ice melts it should be immediately replaced with fresh ice. 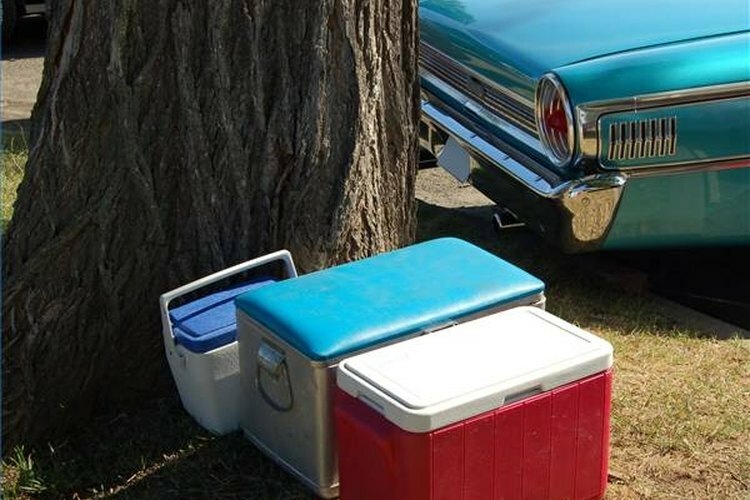 Store cooler in a cool location out of the sun to help maintain an appropriate interior temperature. Do not open the cooler if possible. Store non-frozen items that need refrigeration in a separate cooler so that the frozen cooler does not need to be accessed often. You might want to keep a thermometer in the cooler to ensure it stays below freezing. If the temperature rises, add additional ice cubes.